The first snowflakes have hit the ground and your house hasn’t sold yet, word on the street is that homes sell best in the spring, so you might as well remove your home from the market and hunker down until spring when home buying picks up again. Hold on! Not so fast! There are plenty of reasons why keeping your house on the market may work in your favor. Spring time brings out the “lookers” or window shoppers. The weather is getting warmer, it is a good time to get out of the house, why not go check out a house or two. They have time to make their decision because school will not be starting for months, and they know that there are a lot of houses out there and more will be coming, so they don’t mind taking their time making a decision. So you may get a lot of traffic, but not as much serious interest. Winter buyers tend to be more “serious” buyers. For whatever reason, they need to get a house soon. Why else would they fight the weather, uproot their children from school, and take time during the busy holiday seasons to find a house? They mean business. 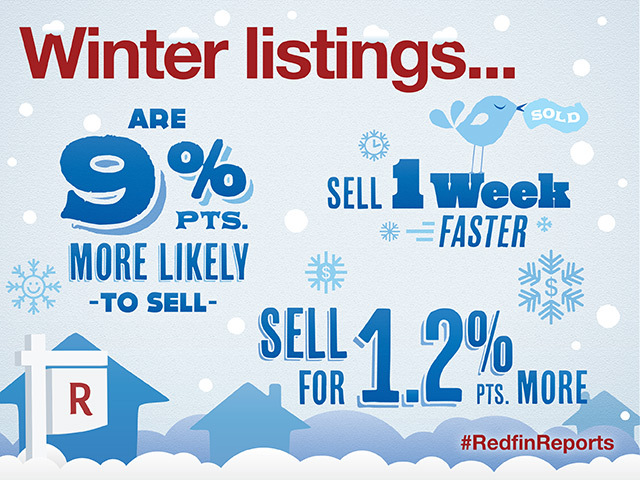 This is why winter house hunting traffic is more likely to turn into solid offers. Economics 101. Supply and Demand. Smaller supply of homes, leads to home prices staying higher because buyers have less houses to choose from and the competition between buyers becomes stiff. In order for buyers to get the house they want (hopefully yours!) they will need to offer the highest price to win the bidding competition, which means that the seller makes more money selling their house (hopefully yours, too!) On the flip side, in the spring, the market is flooded with homes for the buyers to choose from. The competition is not with the buyers now, but the sellers. Buyers will be more apt to try talking sellers down off their price. Why not? If these sellers won’t take what the buyers offer, maybe the multiple other houses listed in the neighborhood will. So if you are ready to sell, don’t let a little snow scare you from selling your home for top dollar! Take advantage of the holiday season to have your house looking festive and inviting. As the song goes…It’s the most wonderful time of the year…even for home sellers!